Project Tango brings augmented reality (AR) experiences to life. From the practical to the whimsical, Project Tango apps help place virtual objects -- anything from new living room furniture to a full-sized dinosaur -- into your physical world. Last month we showed you how to quickly and easily make a simple solar system in AR. But if you are ready for something more advanced, the tutorial below describes how to use Project Tango’s depth APIs to associate virtual objects with real world objects. 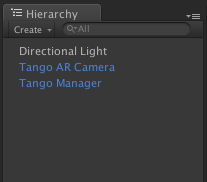 It also shows you how to use a Tango Support Library function to find the planar surface in an environment. So what’s our new tutorial project? We figured that since cats rule the Internet, we’d place a virtual cat in AR! The developer experience is designed to be simple -- when you tap on the screen, the app creates a virtual cat based on real-world geometry. You then use the depth camera to locate the surface you tapped on, and register (place) the cat in the right 3D position. Before you start, you’ll need to download the Project Tango Unity SDK. Then you can follow the steps below to create your own cats. 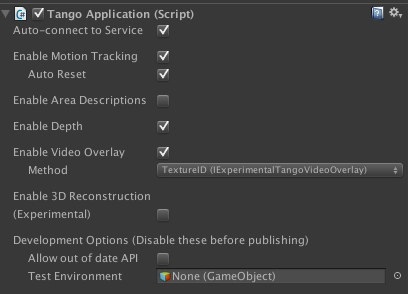 Step 1: Create a new Unity project and import the Tango SDK package into the project. Step 3: Build and run once, making sure sure the application shows the video feed from Tango’s camera. Step 4: Enable the Depth checkbox on the Tango Manager gameobject. Step 5: Drag and drop the Tango Point Cloud prefab to the scene from the TangoPrefab folder. Tango Point Cloud includes a bunch of useful functions related to point cloud, including finding the floor, transforming pointcloud to unity global space, and rendering debug points. In this case, you’ll use the FindPlane function to find a plane based on the touch event. Step 6: Create a UI Controller gameobject in the scene. To do this, click the “Create” button under the Hierarchy tab, then click “Create Empty.” The UI Controller will be the hosting gameobject to run your UIController.cs script (which you’ll create in the next step). Step 7: Click on “UIController gameobject” in the inspector window, then click “Add Component” to add a C# script named KittyUIController.cs. 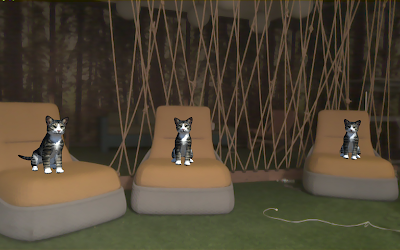 KittyUIController.cs will handle the touch event, call the FindPlane function, and place your kitty into the scene. // Trigger place kitten function when single touch ended. // Place kitten on the surface, and make it always face the camera. We invoke the PlaceKitten(Vector2 touchPosition) function to place the cat into 3D space. It queries the main camera’s location (in this case, the AR camera), then calls the FindPlane function based on the camera’s position and touch position. FindPlane returns an estimated plane from the touch point, then places the cat on a plane if it’s not too steep. As a note, the FindPlane function is provided in the Tango Support Library. You can visit TangoSDK/TangoSupport/Scripts/TangoSupport.cs to see all of its functionalities. 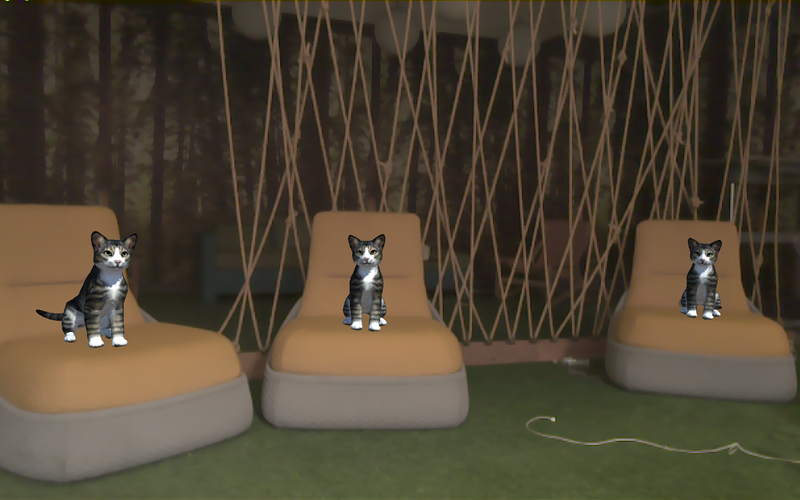 Step 9: Put everything together by downloading the kitty.unitypackage, which includes a cat model with some simple animations. Double click on the package to import it into your project. In the project folder you will find a Kitty prefab, which you can drag and drop to the Kitten field on the KittyUIController. Compile and run the application again. You should able to tap the screen and place kittens everywhere!We hope you enjoyed this tutorial combining the joy of cats with the magic of AR. Stay tuned to this blog for more AR updates and tutorials! So you’ve just created virtual cats that live in AR. That’s great, but from a coding perspective, you’ll need to follow some additional steps to make a truly performant AR application. Check out our Unity example code on Github (especially the Augmented Reality example) to learn more about building a good AR application. Also, if you need a refresher, check out this talk from I/O around building 6DOF games with Project Tango.